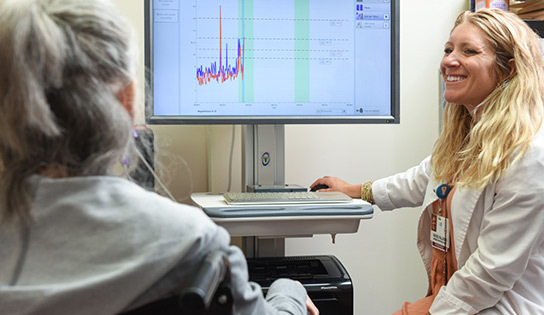 Our dedicated Ventilator Care Unit, staffed 24/7 by Licensed Respiratory Therapists, enhances the quality of life of the pulmonary-comprised patient. Our team of Pulmonary Specialists, Licensed Respiratory Therapists and Rehabilitation Experts deliver all-encompassing ventilator and tracheostomy care as they teach patients to breath on their own once again. To ensure the best possible outcomes, individualized weaning schedules are crafted following a hands-on assessment and close observation. When patients no longer require a ventilator, they are transferred to our dedicated Step-Down Unit for continuous monitoring and care. This Department has been the recipient of the Quality Respiratory Care Recognition award from the American Association for Respiratory Care for the past several years. This award demonstrates the compliance of the Department to a set of National Care Standards established by the American Association for Respiratory Care for the care delivered in a Skilled Nursing Facility.